I arrived at Skaudai CH-B d14-34 today, a system along the Colonia Connection Highway that leads to Jaques Station (aka Colonia). I settled the ship down gently on a pad at the outpost, Sacagawea, situated on the rocky planet 1A. Once underground and in the simulated gravity of the hanger I set about trying to fix the effluent outlet valve on the hull of my ship. The mechanism was stuck, each time I hit the remote on my tablet it grinded and shrieked. I then saw the problem, the inner hose was packed with orange dirt, no doubt filled up from when I hit the ground back in Pyramoe PM-X b33-6. I wedged a driver in and pried out some of the dust when suddenly without warning a gush of foul-smelling, thick, half treated, brown sludge sprayed out of the hose into my face and knocked me onto the floor. It continued to stream out in a disgusting fountain as I slipped and fell trying to scramble out of its way. Out of all the ways I could have had a bad day this was not one I would have imagined! After enlisting the help of a port worker and giving him a few hundred credits, I got the mess cleaned up and used the ports comfort station, had a shower and changed my clothes. I made my way back to my designated hanger and thought I’d have a drive round the port complex in my SRV seeing as it was such a big base. I slowly drove round, obeying signs and speed limits, drove up onto one of the illuminated raised roadways, stopping briefly to deploy a camera drone to take some photos. I then spotted a completely black, unmarked Anaconda coming in on approach for landing, only distinguishable in the dark when it fired its thrusters. I decided to follow it down. I drove beneath it for short while before it came into land on a large pad separate from the rest of the facility. 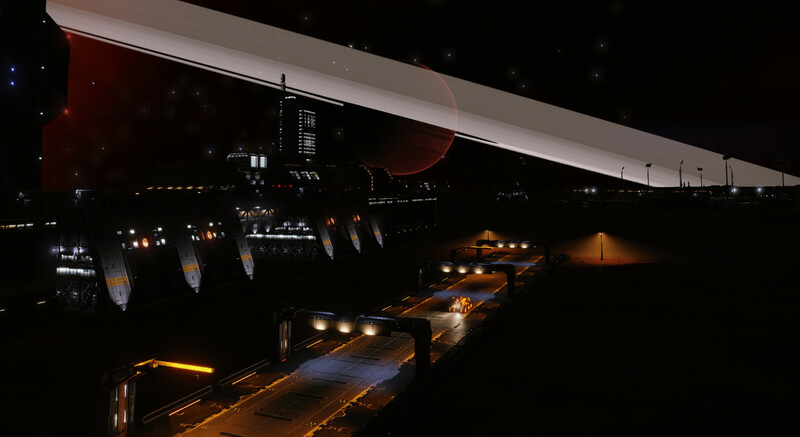 I pulled up a ramp to the rear of the pad behind the blast panels and deployed my drones again, taking a great photo of the ship, the roadway and my SRV. Once I had removed my goggles I noticed a message on my warning panel; “Loitering infraction detected, clear pad approach immediately to avoid lethal response - Fine:300” followed by another; “Docking pad violation, lethal response authorised - Bounty:500“. I double took at the second one “Lethal response authorised”. I could hear the ports security skimmers somewhere close starting up. Instinctively I span the SRV around and drove at full speed back to my hanger hoping the garage access door would still be open. Luckily, it was, and I screeched through the small door way and came to an abrupt stop, the automated lifter pulling me back up into my ship. Back in my cockpit seat, I noticed three figures on the pad in front of my ship. The man in the middle was wearing a smart suit and had a stern serious look on his face, he authoritatively gestured toward the ship and the two other men, dressed in full combat gear, stalked around the cockpit out of view, all the while pointing their pulse rifles in front of them. “Incoming Message” chimed my ships computer, I pulled it up. “Please come to the ship’s rear access door, face away from the door, get on your knees and place your hands on your head”. At this point I also noticed “Wanted” was now above my right-hand status panel. This was a misunderstanding surely, it was not as if I had stolen anything or killed anyone. So, I did as I was told, I made my way to the rear access door and got on the deck. The door behind me hissed open, they had somehow accessed my ships computer and overridden the door. The two black clad armed men entered the ship. One took my hands and placed them behind my back in restraints whilst the other stood to my right behind me. I was pulled to my feet and then thoroughly patted down and had some form of detector baton waved all over me. They then marched me off the ship and across the pad towards the waiting smartly dressed man.